You are here: Home › Notes from the Field › Objects and visual analyses › The unanticipated city: shifting urban landscapes and the politics of spectacle in Chennai. The unanticipated city: shifting urban landscapes and the politics of spectacle in Chennai. Roos Gerritsen, Institute of Cultural Anthropology, Leiden University. The streets of the South Indian city of Chennai have for years been used as the canvas of political competition. Until recently, Chennai’s cityscapes were saturated with billboards, cutouts, posters, painted slogans, murals, and various other signposts. In 2009 however, in the wake of criticism regarding the defacement of public and private walls, the Chennai city administration has attempted to intervene in this encroachment and initiated campaigns to regulate this visual “pollution” of unsanctioned forms of display within the city. They have decided to enforce a ban on posters, murals, and hoardings on two of its main thoroughfares within the city as these are considered distracting and therefore a danger to onlookers. Soon after the city extended the measure and at present the use of 3,000 public walls is now prohibited. 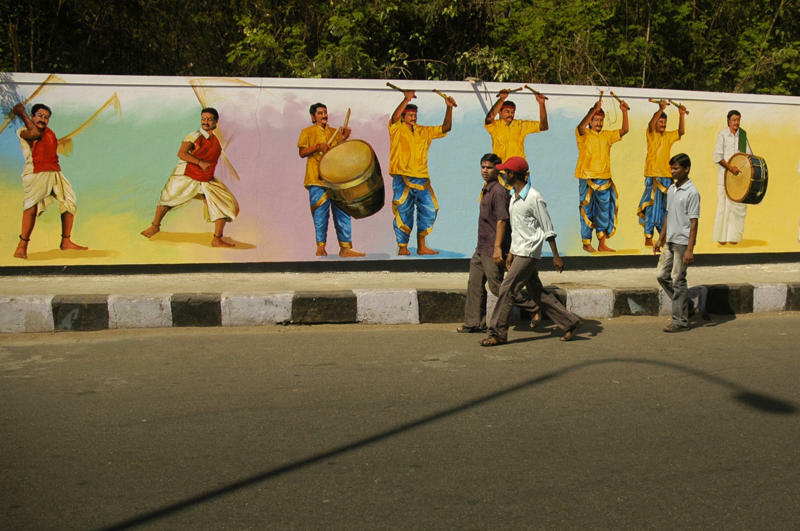 To beautify the roads, signboard artists have been commissioned to cover several stretches of government walls with images of Tamil historic, cultural, and natural scenery. 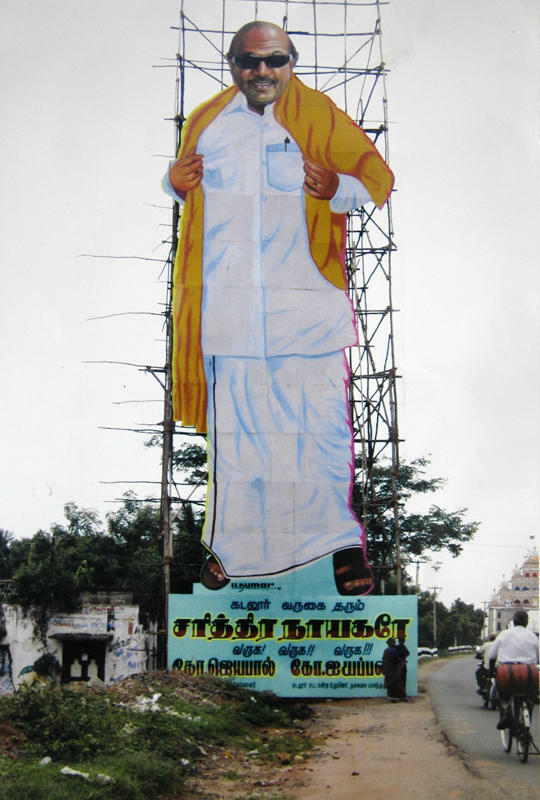 Paradoxically, the South Indian state Tamil Nadu and particularly its capital Chennai have always provided a model for the elaborate spectacle of monumental yet ephemeral imagery dedicated to movie stars and politicians; the same images that are now being replaced. The state shows a long and extensive history of crossovers of cinema and politics. Their intimate connection has created a particular visual culture and remarkable forms of exhibition. Particularly conspicuous have been the gigantic cutouts of up to 30 meters and the ubiquitous murals depicting (cine-)political leaders. Tamil Nadu is particularly well known for this spectacle of leaders and heroes; famous for some and notorious for others. The new restrictions taken up by the city administration have become part of new visual contestations over city space. Moreover, the new wall paintings do not seem to be merely an attempt to beautify the city, but also a way of urging a different morality for its inhabitants. Unanticipated, spontaneous visual regimes are displaced and even exchanged for new visual imaginaries. The recent restrictions of imagery by the city administration are part of a larger beautification project and have to be understood within a wider discourse of city development. Chennai aspires to be a world-class city, with Singapore as its role model. The transformations of public spaces, therefore, have become crucial points in changing the image of the city. In actual practice this goes often at the expense of the urban poor who are deprived of their homes or means of income as e.g. slums are being cleared and relocated in the city’s fringes, or so-called “informal” economies barred from the streets. Within the visual contestations taking place right now, what stands out is the term used by the city itself: beautification. Beautification suggests that the surface of the city has to become beautiful, not habitable per se. In this line, the city attempts to push back the encroachment of public space by restricting its use, particularly that of city walls. 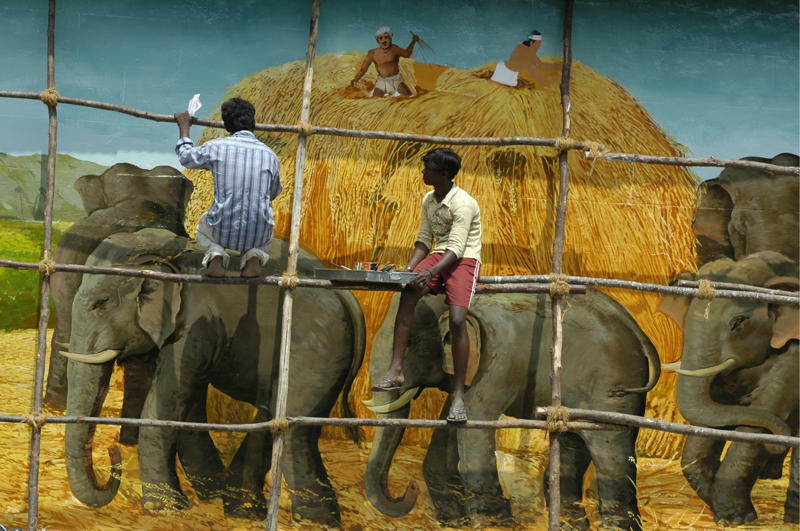 The mayor of Chennai, M. Subramanian, declared that images that reflect Tamil culture will be painted on compound walls of government property in an attempt to keep those who paste posters away and improve aesthetics. Posters are an eyesore, he stated. The city thus has become a visual space, a space to look at, not particularly a space to use. Walls are mostly used by party supporters or members for expressing loyalty to their leaders and need this visibility in order to follow their own political aspirations. Their replacement in this way deprives them of their means to make themselves visible. As the city started with the ban on the main thoroughfares, now, within the entire Chennai Corporation limits, the emplacement of hoardings and posters is restricted. But as is often the case in this regard, in the fringes of the city; in off-road neighborhoods and by-lanes where the implementation of the new rules are not so strict, posters, murals, and hoardings have not made their exit completely. Particularly political billboards outshine all other types of imagery in the public realm, perhaps at present not in size but surely in numbers. The beautification attempts, I must add, are not restricted to Chennai; other Indian cities are working on its outlook in similar ways; initiating novel paintings depicting regional cultural scenes as well. What is happening in Chennai however is somewhat remarkable, as I have already indicated in the outline of this essay. There is something paradoxical at hand here. What is striking in this case is that the politicians that now try to curb these unregulated and “disorderly” formations of the city pre-eminently initiated this visual regime of representation and therefore actually represent this part of the city par excellence. Moreover, Chennai is the only city that went so far as to completely ban all billboards from its skylines. Can we observe an harsh act in reply to the ubiquitous presence of political imagery and the image politics in the state has constructed over the years? It seems contradictory that politicians are now so in favor of replacing their own images with that of postcard images of historical and natural scenery. I do not want to suggest that this beautification tendency is specific to Chennai but that just because of the specific historical background in which public political imagery has been an essential part; the impediment of it now brings questions to the fore of what the political in Tamil Nadu is actually about. Up to now, it has always been argued that political parties triumph because of their ubiquitous presence in the public realm. Do these parties not need this imagery anymore? And the fact that images are replaced by images of ‘beauty,’ i.e. historical and natural scenery that should reflect Tamil culture as postcard pictures; can we argue that the imaginations and desires of some replaced by that of others? To whom are these new images dedicated? In other words, who owns the public sphere and who owns beauty? 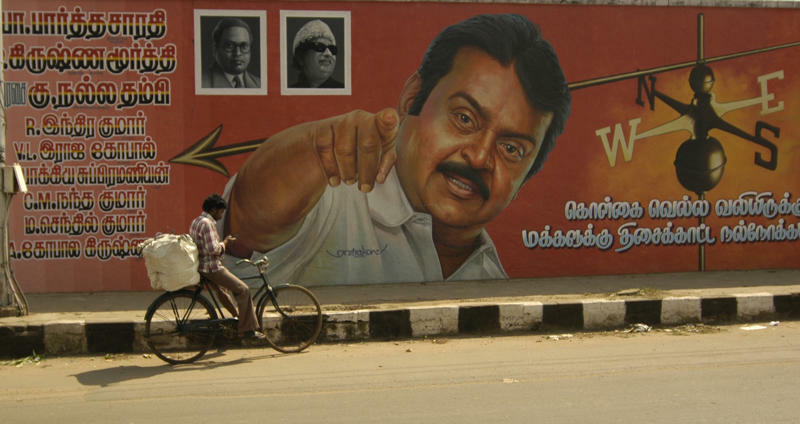 Walls in Chennai have since long been channels for public and particularly political statements. With the beautification project being implied, the main opposition party, the AIADMK, is under the impression that the leading party, the DMK, is repressing their opportunities to use walls. Agitations have been held by the AIADMK, in favor of using walls of the Corporation, walls that actually have been declared to be part of the beautification project. The AIADMK members have complained that the leading party is not giving them any space and that the DMK even claims the remaining walls and publicity spaces. In response, the DMK has given the AIADMK more walls to use. The battleground of these parties lies for a certain part in the use of public spaces, even after the restrictions. But the beautification project does not seem to be motivated by the ruling out of political competition. Instead, it seems to be motivated by a discourse of rationalizing and modernizing the city and replacing the unanticipated with novel, more elitist imagery. Hoardings, political and commercial ones, are often pulled down justified by the reason that they obstruct traffic and pedestrians. But what you can see in discussions on the danger of these objects is that often moral objections seem to persist in the background. Hoardings are said to distract and influence people and therefore have to be removed. Do people get distracted from hoardings showing the same political face over and over again, whereas they apparently do not by driving past beautiful images of rural scenery, historic temples and dance performances? Wouldn’t they be more dangerous just because these images are ‘beautiful’? The explicit and implicit morality present in the discussions on public imagery justifies its replacement with novel images; images that are of a different order, images that, more than that, have an intentional pedagogical objective. The city says it has selected pictures that reflect Tamil culture and emphasizes that the pictures are good to look at and show Tamil Nadu’s most beautiful tourist attractions but also, and more importantly, educate the youngsters about their cultural roots they are all forgetting. But which and who’s culture? One of the artists working on the new wall paintings told me that he and his colleagues proposed several images to the city administration in charge of the beautification project; images that for them are so typical and telling for their surroundings. They made some sketches of rag pickers, little boys buying ice cream from a vendor or a sun set on Chennai’s main beach. But the city rejected these images as they do not reflect Tamil culture as they see it. However, at the same time, on one of the stretches where new paintings have been applied, the adjacent golf court managed to have a golf scene painted along the row of historic monuments. Again, the culture that is presented here is a culture that is formed by and in its presentation addresses another class than the ones previously using these walls, however, bringing others in this as well. And this brings me to the last fragment of the paradox I am observing here. It is situated in the refurnishing of public space and the ways in which politicians forget their own roots and roles in its formation. It is put into words aptly in the following quote, an excerpt from a blog of the Times of India website: “…Thiruvalluvar, Mamallapuram and Bharatanatyam do contribute to the culture of the state, Thus how can you call it the essence of Tamil culture without the colourful politicians? Always on the walls of Mount Road, they were the friendly neighbourhood Spidermen of Chennai. 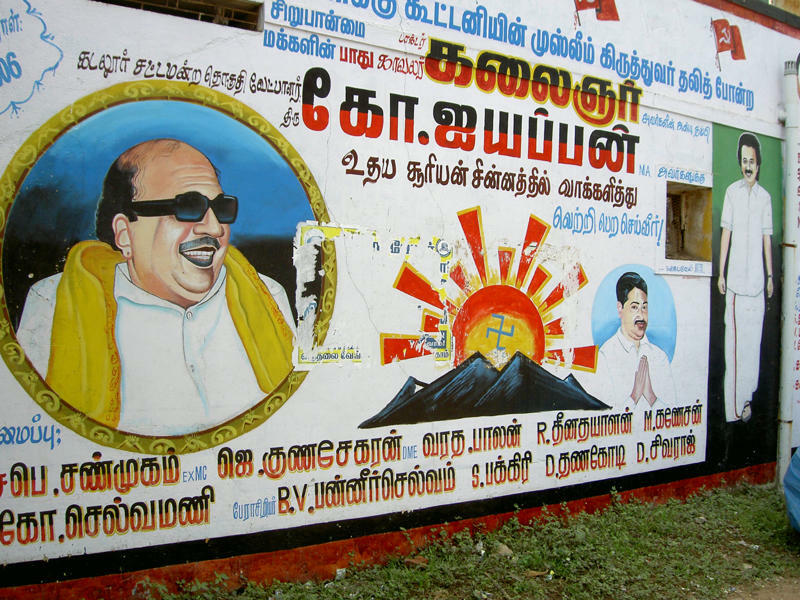 I miss Kalignar Muthuvel Karunanidhi in his trademark dark glasses smiling down from vinyl billboards at the Thousand Lights traffic jam. I feel motherless as I stare into the void left behind by the cut-outs of Amma alias J Jayalalithaa on Mount Road. When my boss says I lack aggression, how do I convince him it is because they have removed all the posters of Vaiko whose roar for the dead tigers of Lanka used to instil a revolutionary zeal in me on my way to edit meetings? ‘Karuppu MGR’ Vijaykanth has been whitewashed; S Ramadoss has been shredded. On the smaller roads and bylanes, however, they all thrive in myriad forms” (Blog post from Arun Ram, Times of India website 03-08-2009). The author exactly pinpoints that the politicians that now curb the unanticipated exhibition of ads actually belong as much to what is called the ‘essence of Tamil culture’ as other historical events would. It shows the shift from more common uses of public space to more elitist visualities in which morality, pedagogy and the allegedly beautiful seem to be a motivation of the effort. The public realm is less and less owned by its former users, and now more and more incorporated in elite and political imaginations of a ‘modern’ city. Thus, unanticipated and spontaneous public space is replaced by organized, rational space, but also by new, other imaginations and desires of what history and beauty should be.